Darwin Bombing Memorial - USS Peary. 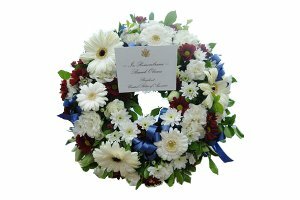 The Darwin Bombing Memorial to USS Peary was visited by US President Obama who laid a wreath to remember those killed in the Japanese bombing raid in 1942. 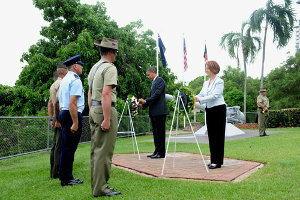 US Preident Obama and Prime Minister Gillard Remembering bombing of USS Peary. 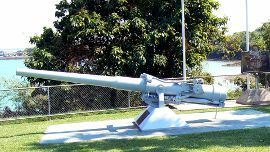 Located on the cliffs of the Darwin Esplanade, a salvaged gun from USS Peary points seaward to the location where the Peary was found by divers searching Darwin Harbour after the war. The memorial gun points towards the USS Peary wreck. Recovered by Carl Atkinson and restored by the Royal Australian Navy, now a memorial to the 91 crew who went down with the ship, the US Navy's greatest loss of life in Australian waters. Survivors, Melvin Duke and Dallas Widick attended the unveiling of the memorial on the 29th January 1992 along with a colour guard from the USN frigate Robert E Peary. Information on site of USS Peary memorial. Dive bombers appeared and began bombing the ships in the harbour....At about 10:10 Peary was hit in the after four-inch magazine, the bomb penetrated through two deck levels and the magazine exploded tearing the after part of the ship apart, actually liftingthe torpedo mountsoff their bases and causing the warheads to explode. Shrapnel from near misses created havoc. Incendiaries slammed into the galley and amidships, creating fire and more smoke. Next a bomb penetrated her decks, through her forward four-inch magazine, blew out her hull near the bilge keel and blew up the magazine. The men from the forward fire room, burnt and injured, climed up the airshafts. Peary was at once a mass of fire and black smoke from forward to aft...."
I would like to mention besides Dallas Widick and Mel Duke, my father Stanley Ashman was also a survivor from the Peary, I believe there were about 24. Dad made it to the 50th celebrations but sadly he passed away on his return home. Dallas and Duke have also passed away. Mel Dukes wife brought his ashes to the Peary site and spread them on the sea. I was very proud of my Dad and what he did for his family and Australia. 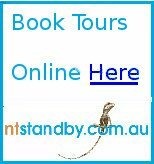 I have since been to Darwin and visited all the sites my farther did when he was there. He lived in WA in Brunswick. Visit the Darwin Military Museum located at East Point to see more about the defense of Darwin. 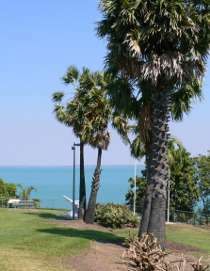 Darwin Harbour was a significant staging point during the war. Return from Darwin Bombing Memorial to Enjoy Darwin Home.